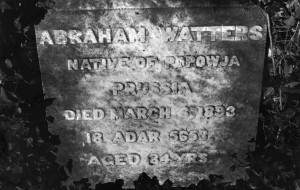 Born in the Prussian-occupied Polish town of either Popowja or Rogasen in 1809, Abraham Watters settled in England in the 1830’s. By 1837, he was in America. In the 1840’s, he lived in Georgia and Missouri, and was naturalized in St. Louis in 1847. Abraham Watters came to San Fran­cisco in 1849. In 1850, Watters was a partner of Lewis Newfield. Their store featured jewelry and clothing and was located on Kearny be­tween Clay and Commercial. In the mid-1850’s, Watters and his brother, Ichel, operated a hotel in Sacramento. Abraham Watters was also involved in jewelry ventures in Guaymas, Mexico in the 1850’s, and at Caracas, Venezuela in the 1860’s. In 1866, Ichel and Abraham Watters opened a jewelry business in Salt Lake City. 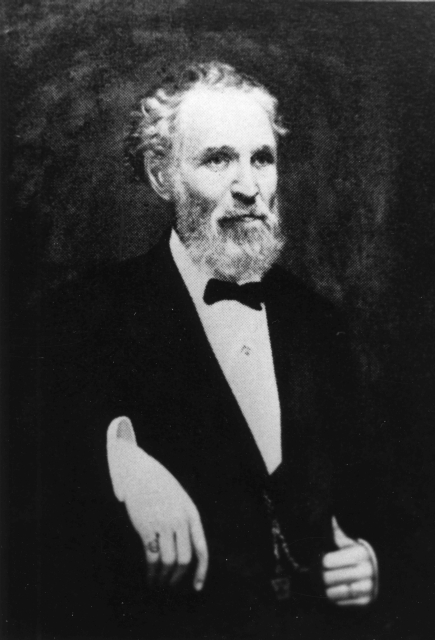 Abraham divided his time between Salt Lake City and San Francisco until 1878, when he returned to England. He lived there until 1888 when he returned to Utah to live with his brother. In January 1850, Watters helped organize the First Hebrew Be­nevolent Society and became its vice-president, and, in the fall, was elected its president. The Society established San Francisco’s first Jew­ish cemetery in April 1850 (Vallejo & Gough), which served the community until 1860. In 1851, Abraham Watters presided over the meetings held to form a united congregation in the Bay City, which resulted in dis­agreements that led to two congregations in April 1851: Congregation Sherith Israel andCongregation Emanu-El. Watters, a Pole, became the found­ing vice-president of Congregation Emanu-El under Abraham C. Labatt, a Sephardic Jew. But as its membership was mainly Germanic at that time, Watters soon associated with the Polish synagogue, Congregation Sherith Israel. When Congregation Sherith Israel built a new synagogue at Post and Taylor in 1870, a number of its members decided to stay with the old 1854 building on Stockton Street. They formed a new Orthodox congregation, Shaare Zedek, of which Abraham Watters became the first president. Abraham Watters attended the first meeting of a Ma­sonic Lodge in the Far West in 1849. He was active in the Masonic and Odd Fellows orders, and in the Kesher Shel Barzel (“Band of Iron”). Watters had been president of the California branch of that Jewish fraternity. 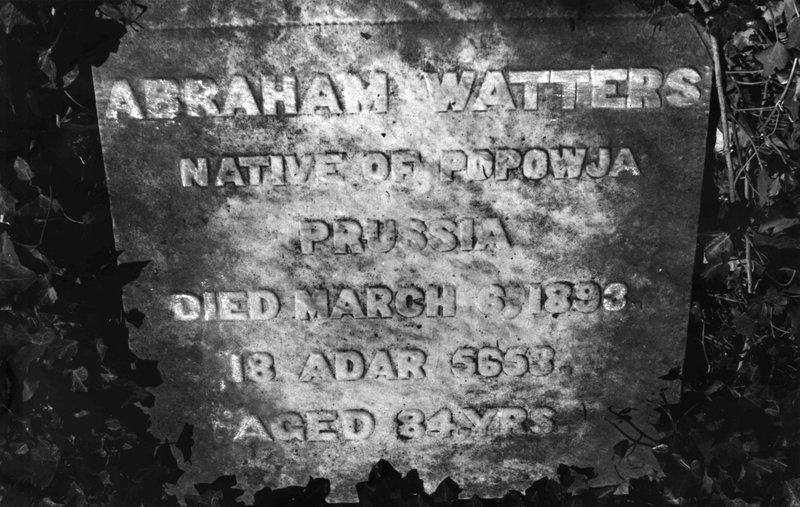 Abraham Watters died in Utah in 1893. Norton B. Stern, “Abraham Watters,” Western States Jewish History 41/2.